Born in Macedonia, Bahar has been into all kinds of electronic music from an early age. 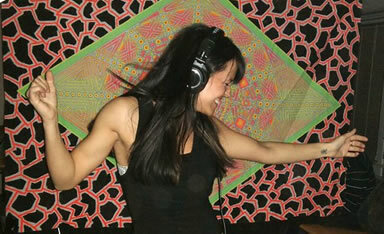 She discovered the psychedelic scene in 2007 and found it touched her like no other music. An avid trackhunter, she learned how to mix for fun playing her favourite tracks at Open Air parties in Copenhagen. She loves to give the crowd a special psychedelic experience that touches them in their hearts as well as their heads. "I never make a set ready from home, i just play from the heart and hope i can feel the crowd like this. I also like foccus on making a nice flow and connection in my mixing techniques, which is as important for me as the track selection. I become one with the sounds while mixing which gives me an extra kick and i just love it so much! Its really important to make the set a special journey." She plays psychedelic full-on, nighttime and high tech. Since 2010 she's been promoting her own parties in Denmark called 'Chakra'.